One more project snuck in at the end of my day. I was awake from 4 to 6 a.m. this morning, too uncomfortable to go back to sleep. 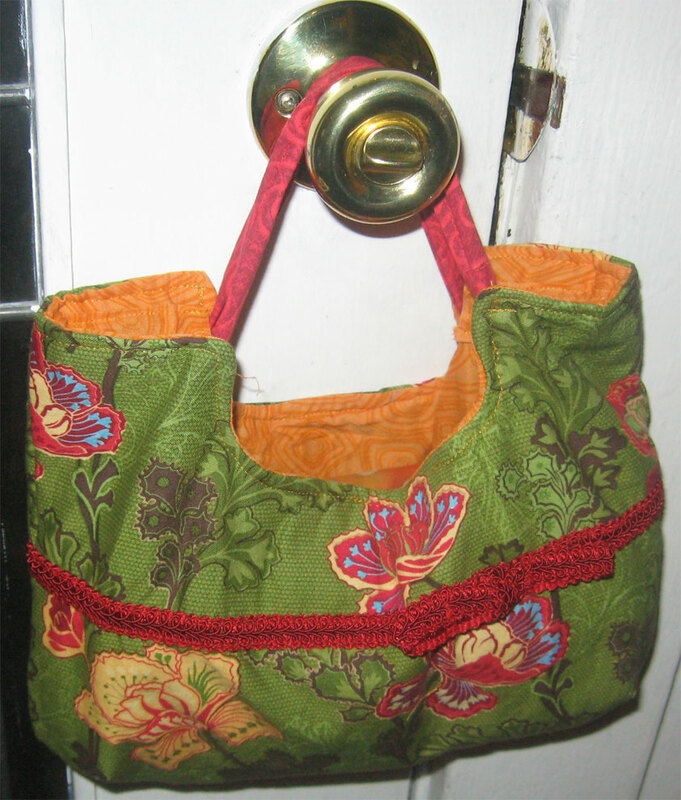 During the time I spent awake I decided I really wanted a new spring handbag, but that such an endeavor was really not practical given that I already have made a new messenger bag to carry both my purse items and a few baby things as soon as the little guy makes his appearance. But after we got back from our family walk this evening and I was still feeling all energized from the warm weather, I decided to go ahead and make one anyway. Maybe now that I’ve done something silly like this I’ll go ahead and go into labor! Or maybe I’ll get to carry this cute new bag for a week or two, then transition over to my messenger bag at the point I start needing to tote diapers. Either way, I’m happy with the way it turned out. It’s from Amy Karol’s Bend the Rules Sewing, and I felt like the pattern was good except my bag appears a bit smaller than the one in the book’s photograph, although I followed the pattern and directions as listed. Now that I have this cute and impractical item on hand, I think I’ll go ahead and call my hair stylist tomorrow and try to move up my next hair cut and color to this week if possible. I’d made the very practical decision to schedule this one a few weeks after my due date, but for pete’s sake, I’m showing my gray and I need a hair cut, and I’m about to be in a bunch of family photographs holding my new baby–I think I need the hair boost now! Wow! What an awesome bag:) Enjoy your last week of peace of quiet….